A stubbornly high unemployment rate and last month’s soft job gains indicate the economy has begun losing momentum. As employers hired at a brisk pace through the first quarter, unemployment receded to 8.8 percent by March, helping fuel optimism among corporations and individuals that a private-sector led recovery had finally emerged. In May, however, indicators demonstrated that the pent-up demand for new workers may not have been as robust as anticipated. Positive, but weak, hiring trends are sufficient to alleviate fears of a double-dip recession but have sparked concerns of an American “lost decade,” reminiscent of Japan’s low-growth, high-unemployment economy in the 1990s. Though the Fed chairman recently hinted at a continuation of its accommodative policy to support the economy despite inflationary risks, questions remain whether this will be sufficient to advance growth. The unemployment rate rose to 9.1 percent in May, 30 basis points above the post-recession low. Additionally, the four-week rolling average of initial jobless claims remains near 425,000, approximately 50,000 weekly claims higher than the level necessary to drive the unemployment rate lower. Nonetheless, some positive factors have emerged. The under-employment rate, which includes discouraged job seekers that have dropped out of the labor force and those that are working fewer hours than they would like, ticked 10 basis points lower to 15.8 percent, well below the peak of 17.1 percent last September. In the prime apartment-renter cohort, those aged between 20- and 34-years old, unemployment is 190 basis points above the national average at 11 percent. The outlook for this group has shown steady improvement, however, as an additional 566,000 members of the cohort have become employed over the past year. 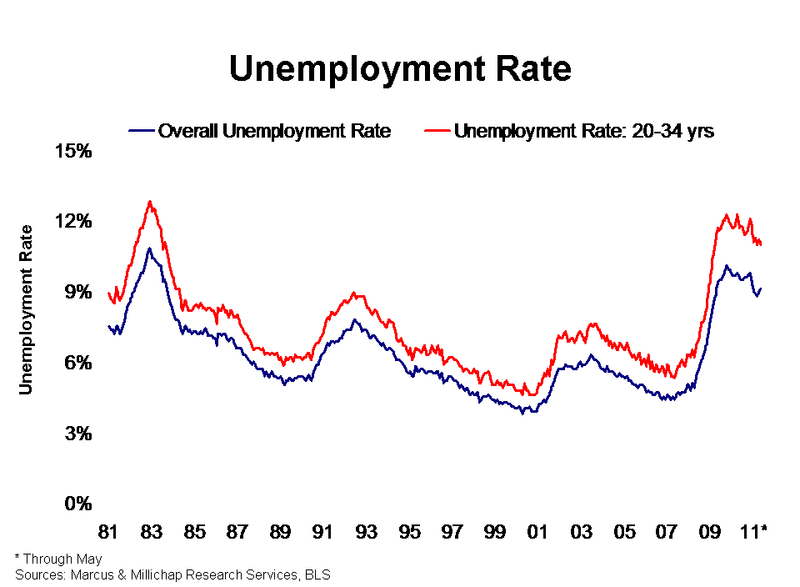 This increase pushed unemployment in the segment 70 basis points lower in the past 12 months. As further job additions translate into more apartment demand, vacancy in the sector will drop to 5.6 percent by year end, an annual improvement of 100 basis points. The industrial sector struggled through the past month due to supply disruptions from Japan. Manufacturers, in particular, cut 5,000 jobs after adding nearly 10,000 positions in each of the previous three months. The idling of auto plants will be temporary, however, and overall industrial vacancy will begin to retreat this year. During 2011, industrial vacancy will dip 50 basis points to 12.1 percent. Nonetheless, the rate is 180 basis points above the 10-year average, indicating that property owners must wait another year before pushing rents higher. This entry was written by marcusmillichap, posted on June 15, 2011 at 8:57 pm, filed under Research and tagged Employment. Bookmark the permalink. Follow any comments here with the RSS feed for this post. Trackbacks are closed, but you can post a comment. fear they are getting ripped off and you surely don’t want that. Avoid buying a lemon by looking through these great tips and tricks regarding car purchases.